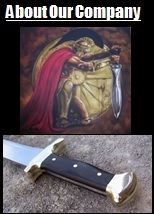 Scorpion Swords & Knives – Handmade Swords, Knives, Spears & Bows. Our Home Page. Chris Palmer, Owner. Create Your Own Weapon! Click Here for Details. Our site is designed to assist you with your shopping. Close up pictures of all our products are available to view at different angles, along with detailed descriptions. Links to all our prices are available from almost all our pages, along with access to Order Now, and links to contact us. Check out our YouTube Video Page to see slicing, chopping, and stabbing demonstrations! Read about our high quality heat treated spring steel we use to ensure our weapons are extremely durable. CURRENT WEAPONS DISCOUNTED for a Limited Time! Click on images to see sale prices. Watch Us Demonstrate on YouTube.